At Mann Orchards, we believe in a Farm to Table approach to food, and we proudly serve our own field grown produce alongside of other locally sourced ingredients to bring you a fresh and satisfying lunch menu every week. Mann’s Farm to Table program demonstrates our absolute commitment to providing our customers with the freshest, locally-grown products. 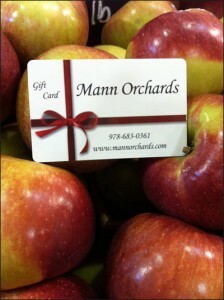 You heard that right – a new Mann Orchards lunch menu is created for you each and every week! Don’t miss out on this week’s menu specials! Come in and enjoy your country lunch in our very own cafe. Or call in your order to-go. To-go orders can call 978-683-0361. Give the gift of Country Lunches, buy Gift Cards online NOW! Lightly breaded haddock with homemade tartar sauce and crisp lettuce on your choice of wheat or white wrap. Our own homemade hearty sweet and spicy chili. Made with simmered ground beef and sausage, diced tomatoes, peppers, onions, red kidney beans and a special blend of garlic and spices. Just like mom makes! Served with a piece of homemade cornbread. Seared strips of lean beef and pearl barley with red peppers, mushrooms, peas, tomatoes and green beans in a hearty beef stock. Several different meat and vegetable varieties available. Served this week with a small side salad. A Valley favorite…. Tender white-meat chicken served warm on a deli roll with fresh leaf lettuce and mayo. Italian style sausage with roasted peppers and onion with fresh provolone cheese. Served on a toasted Milano roll. All white-meat chicken blended sweet cranberries with mayo. Served with lettuce on your choice of wheatberry, marble rye or Texas toast. Applewood smoked bacon, sliced tomato, crisp romaine and mayo on your choice of wheatberry, marble rye or Texas toast. A bed of mixed greens tossed with balsamic vinaigrette topped with a blend of chopped vegetables, parmesan cheese, and homemade croutons. Sandwiches are served with chips and fresh apple slices on the side.